About 2 months ago, my hunter was in a major pinch for gold. He was trying to level up his engineering and leatherworking professions. In addition, he was trying to keep his gear enchanted and gemmed for the (no-commitment) guild's casual raid. With all those expenses, he simply couldn't keep up. Enchants missed, cheap quality gems used, and no-food or flask buff throughout the raid. That's when he came up with this sure-fire way to make gold fast in the game. It does not require any marketplace skills or persistence. No need to install, configure special add-ons (but TransmogCleanup helps!) It just needs a max level toon (preferably one with a WOD garrison hearthstone) and either a vendor mount, large bags or patience standing at the mailbox. Loot every corpse. Even if you don't have bag space, when you attempt to loot, it will appear in your mailbox. Look for things that help speed looting up, include engineering Loot-a-rang, Hunter FETCH skill. Also, don't try to kill things at range, instead gather everyone up into a bunch and AOE them down. Run with a class (or select talents) that grant a nice run speed, like a demon hunter, or a priest using magic feathers. This level 85, Cataclysm expansion raid consists of 7 bosses arranged around a large arena. I like this raid because you can mount up for all but the last boss. 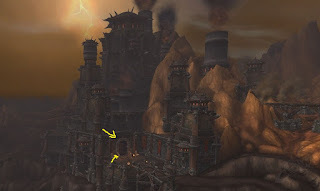 Step 1: Hearth to your faction capital (Orgrimmar, Stormwind) then fly over and take the portal to Mt. Hyjal. Step 2: Fly south to Firelands raid entrance. Enter! Step 3: Kill and loot everything! I like to mount up and make a clockwise loop (entrance is around 7 o'clock) around the raid. You should be able to aggro everything (except doggies which stun you) and do a simple AOE rotation to take them all down quickly. If you haven't run this raid before, one boss only spawns after you've killed enough of the trash. Watch raid chat for his announcement. The bridge (top of image) isn't accessible until you've cleared all the bosses visible here. There are three mounts available. Two have low drop rates from Alysrazor (flying bird boss who's mount is a bird DOESN'T FLY!) and the final boss Ragnaros. Third is the Glory of the Firelands Raider (which so far requires a group of 6-ish people). I see only one on the drop list. Smoldering Treat. I collect one for myself, then sell off all the seconds. This level 100 Warlords raid is easily solo-able at level 120. There are three levels to it (Normal, Heroic, and Mythic) that you can run back-to-back for loot. There are 10 bosses, and while you cannot mount up between them, there isn't a lot maze running. Step 1: Hearth to your garrison. Step 2: Hop aboard the taxi to the Iron Depot. You can easily fly here, but why when you can also take a quick snack/bio break here. 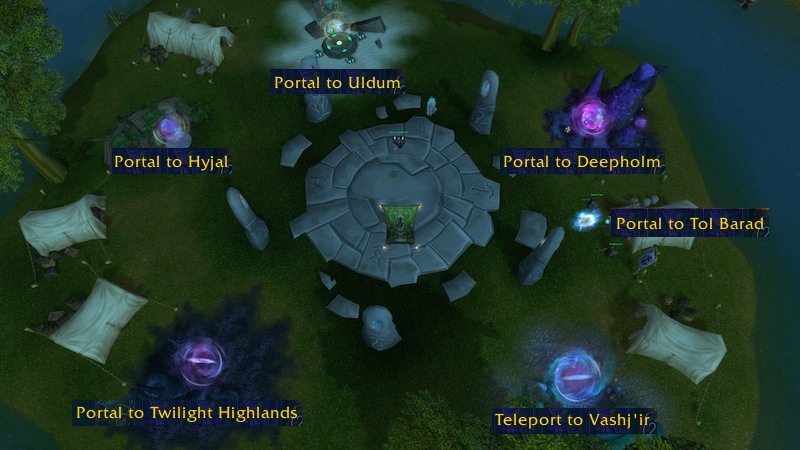 The entrance to the raid is the portal in this screenshot. Step 3: Kill bosses (mostly). I don't get loot from trash often, so I've been running passed them recently. Slagworks: Enter at swirly, then bosses 1, 2 then 3. Iron Assembly - Beastlord Darmac, Operator Thogar (can be buggy- the train will come in on line one. If only one canon shows, exit raid and come back in). After Thogar, an entrance will open in his area, jump down the shaft (there's no falling damage) and kill all the trash to start the Maidens fight. (Don't miss the 5-6 trash 'working', submerged in the water). Black Forge: The quest giver (X) gives a skip quest for later. Black Forge - When you land in the water for the maidens, you moved to the Black Forge. After you kill the maidens, run along the path lined with giant mushrooms. Take the path to the left to the elevator shaft. Take the open archway to Hanz and Franz (think SNL). Follow the path to Flamebender Ka'graz then Kromog. After his kill, there's an arch to the right, another path lined with mushrooms (you have been here before. Take the elevator back up to the lobby. Crucible - aka Blackhand- The bridge over the lava has now cooled and you can cross it without dying. Take out Blackhand's bodyguard then Blackhand is a quick kill. Notes: Blast Furnace is the most annoying boss (to solo) in this raid. It consists of damaging the hampers of the furnace until it explodes then killing the elemental inside. To damage the hampers, you must run explosive bundles to the hampers (one on each side). The explosives drop off the engineers. I found if you kill them right next to a hamper, you can click the explosive satchel and the action button a couple of times. ENGINEERS WILL HEAL the furnace so don't try doing both sides at the same time. After you've completed a raid, your bags (and mailbox) will likely be full. These two raids drop ilevel gear in the 100-150 range. Sell all these soulbound items. TransmogCleanup does a really good job with this as you can set a threshold to sell all items sub 300 (or whatever your equipped gear is). You can also have it NOT sell other items (BOE, Legendary item). I like to pass any crafting materials and BOE items to my bank alt for consideration of selling them on the AH. Lastly, I send over green items to possibly be disenchanted. Let me know if there are other raids that you like to run for gold? There are 43 (as of 8.1) different raids available. With legacy loot rules taking effect on raids 2 expansions ago, I probably won't be running Legion raids soon (at least for gold). Maybe LFR edition? Hellfire Citadel, dislike, it's a bit of a maze and a LOT of running around. Siege of Orgrimmar isn't too bad but takes a while to complete. Throne of Thunder is a bit of a hike to get there. Of the Cata raids, Dragon Soul is probably worst of the bunch to solo because of the Spine fight. Wrath, BC and Vanilla raids (IMO) don't seem to drop as much loot, so if I run one, it's usually just for an achievement or mount/pet drop.